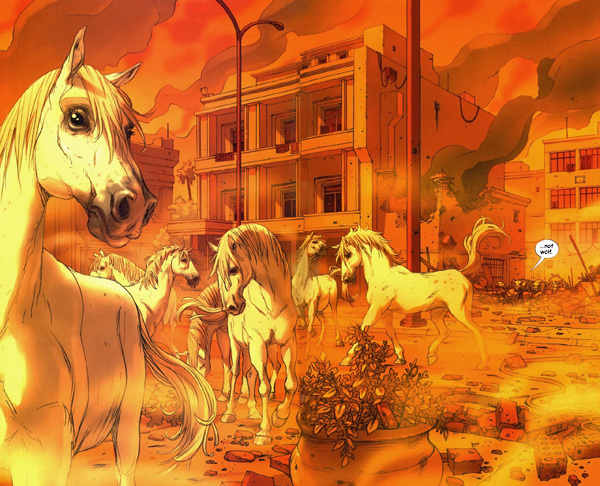 Brian K. Vaughan has established himself as one of the heavyweights in the industry over the past decade, with major titles at almost every publisher. 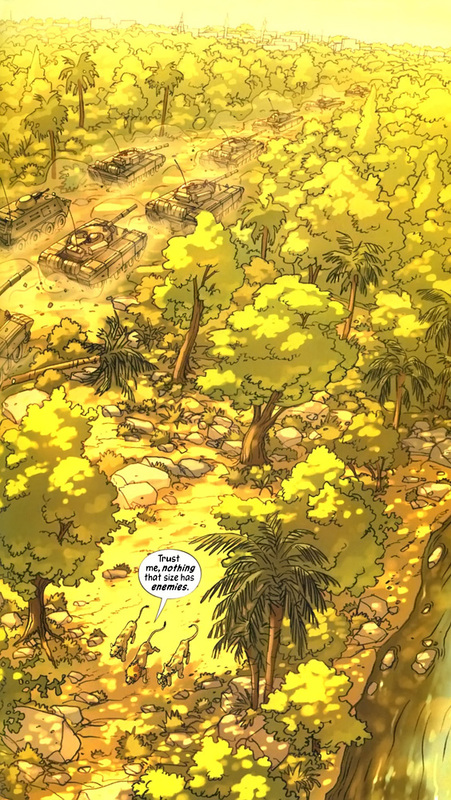 In the midst of writing Marvel’s Runaways, Vertigo’s Y: The Last Man and Wildstorm’s Ex Machina he managed to make time to write this stand-alone title for Vertigo. How does this man have so much time? 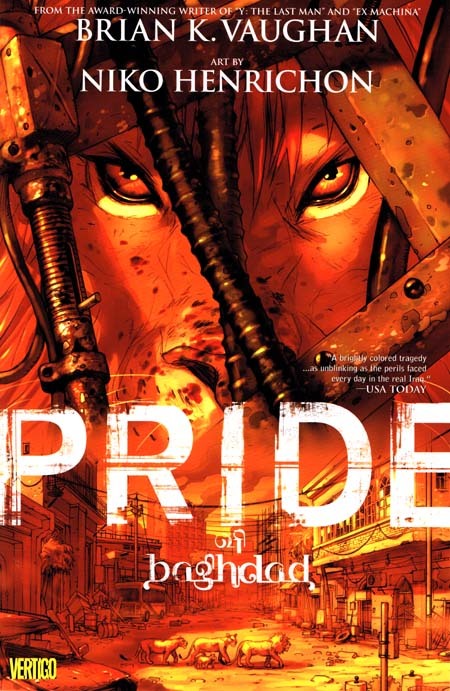 Pride of Baghdad is an award-winning story about four lions that escaped from their zoo during the bombing of Baghdad in 2003. They were then found roaming the streets of Baghdad by US troops. Vaughan gives us a fictionalized account of what happened to the lions between the bombings and their detection by the troops. There are moments throughout the book where the writer uses ignorance of the world of man to make subtle commentaries on the Iraq war. One of the most explicit (and memorable) is the observation that the Iraqi tanks they come across are some kind of predator. I have to admit to be a long time fan of Vaughan’s work. I first encountered his writing in the third volume of Swamp Thing, which unfortunately is still uncollected. 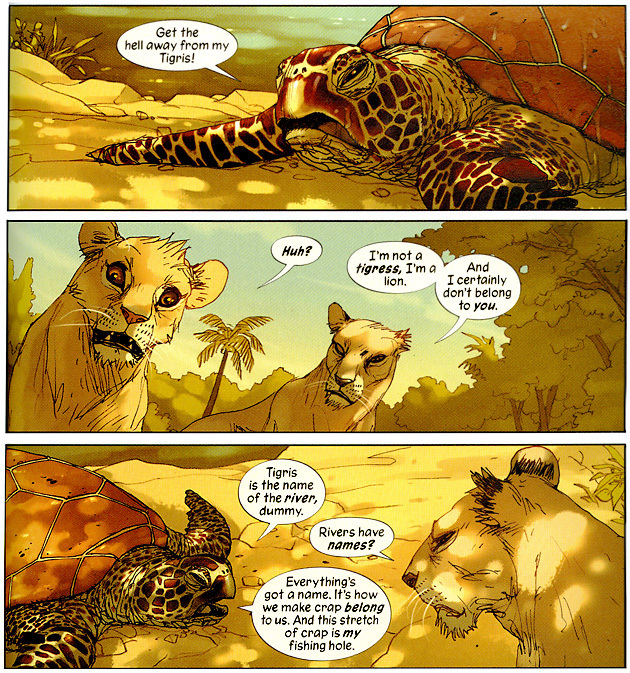 BKV’s style is suited towards characters that evolve slowly, growing socially through some 50 odd issues. If you’re familiar with his longer runs, you’d be forgiven for thinking that an original graphic novel wouldn’t suit his writing style and that it’d be over before the characters had even grown familiar. Thankfully this wasn’t the case. I was able to connect with every character quickly. My only real complaint is that it was over too quick. Even though it is 130 pages long, it feels like it’s half that as it goes by so fast. This is both a testament to his writing skills and versatility; that he was able to switch from serial writing to this style without losing quality. Past my love affair with Mr. Vaughan, we move onto this book’s artist Niko Henrichon (Barnum). I have to admit that I had somehow never recognized his name before this book, despite owning Barnum. After reading Pride of Baghdad, I was left seeking more of his work, only to be annoyed at how little there is out there. 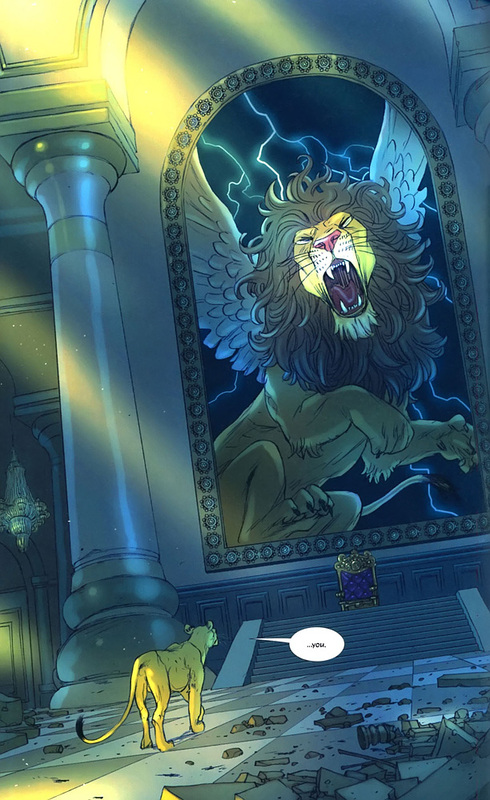 To say I was blown away by his illustrations would be putting it mildly; every page could be enlarged and made into a stunning poster with no retouching required. I have recently stated how I dislike the glossy paper in the newer collections, in comparison to the old rougher paper. It can make colours with a forced saturation to them. This needn’t be the case, as Niko shows here. While the pages are full of vibrant colour, it’s all in harmony that I can only imagine leaves other artists in envy of his skills. This book can feel like a grown up version of The Lion King, but don’t expect to ever see this in the West End or on Broadway as a musical. There is no escaping the commentary on the Iraqi War as you read this, but it is subtle enough that it doesn’t detract from the flow of the plot. 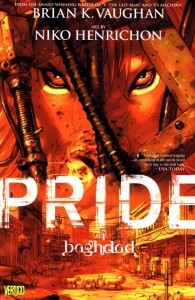 Pride of Baghdad is a book in my collection that I give to friends who have never read a comic before or claim to dislike the medium. I have yet to receive it back from someone who wasn’t moved by it. I was going to rate Pride of Baghdad a very high 4 out of 5, until I was instructed that anything less than 5 out of 5 would result in being disowned by several close friends. To be fair they are right. It should be 5 stars. I’m just a bit hesitant because all my recent reviews are so highly rated. As a self contained Original Graphic Novel, there’s no continuity to speak of. Delve straight into this. 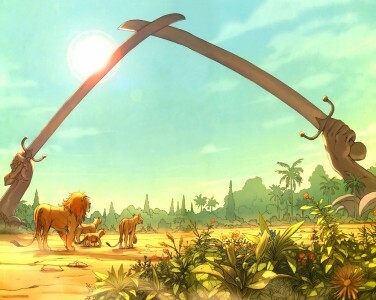 If you feel you must do something before jumping into the book then watch The Lion King again. 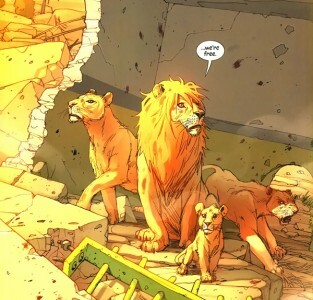 That should get you reacquainted with talking lions. Go check out Niko’s wonderful website and drool some more at his great artwork . Finally you might like to get your hands on the first volume of either of BKV’s two epics, Y: The Last Man or Ex Machina. Ian also heartily recommends Beasts of Burden for your talking animal fix. Thanks for this review, Simon. It’s ok to keep giving 5s, I can understand wanting to share and talk about work that you love. My friend Daniel brought up an interesting thought about this book. He said it would have been a lot better if the animals never talked. I kind of want to read it through like that, but it’s hard for me to ignore the word bubbles. I agree it does sound like a nice idea for the book; the only issue with that non-comic readers would end up flicking through the book in like 5 mins and we’d have no converts. haha, probably. Idea for a deluxe edition? I mean, they did hush with just the pencils, they could do this one with just the art. It sounds like a neat idea, kind of surreal, but it would definitely only be for avid fans of the medium. Great review, and I agree on the 5 stars. This has some of the most beautiful and touching art I have ever seen in a graphic novel, and Vaughan’s writing is so poignant in this book. Heck, the last two pages make me cry every time I read, and I’m not ashamed to admit it, either. I am a teacher and would love to one day use this book in class or add it to a summer reading list. I agree that Pride of Baghdad would serve as a wonderful introduction to the medium, and have offered to lend it to several of my friends. The fast pace of the story also helps in that regard. I’ve actually seen this on some class/recommended reading lists. When I talked with the owner of my local comic book shop about ideas for graphic novels in the classroom, this was one of the first ones he picked up. I will be teaching X-Men: Magneto – Testament to one of my classes right after my winter break; I’m really looking forward to it. huh, I don’t really know that much about that one. I’ll have to read it at some point. Testament is about Magneto’s time in Auschwitz. It incorporates fact with it’s fiction and includes a teaching guide in the back. It’s wonderful storytelling and stunning art. I highly recommend it. I looked it up after you last mentioned it. Very interesting. I’m curious to see how much it tells a story that hinges on being part of the Marvel mythos, and how much it stands on its own. fair enough, I’ll keep my eye out. Of course, if you decide you’d like to review it yourself, I’d be excited to read that! awesome, I’m always looking forward to feature other opinions. I feel the site would get a little boring with just me yapping all the time. I bought the book because of your review and so a big and hearty thank you because I loved it. You are correct in that anything less than a 5 wouldn’t do. After I finished I realized that I would give it a 4 or 5 but that there is not a single aspect of this book I could find fault with. The writing is good, the art is great, the story is touching. Hey Drakul, thanks for the feedback and I am very glad that you enjoyed the book as much as I did. I am still waiting for Niko to do more published work as online content is not the same. I loved this book and it nearly moved me to tears. Im going to recomend it to all my freinds and you did a great review.